Sauna Open Air, since 2004 in Tampere, Finland, held rock and metal festival takes place this year in Ratina Festival park June 8th to 9th. During the years the festival roster has gathered together legendary bands and new talent of the genre. Sauna Open AIr Metal Festival takes place on Ratina Festival Park, Tampere, Finland. Concert place is just a few minutes away from the centrum of Tampere. You can easily arrive to Tampere city centrum either by bus or by train. Sauna Open Air Metal Festival venue is in Ratina Festival Park and Ratina Stadium. There is only a few minutes walk from bus station to festival area. From train station it takes only 10-15 minutes walk. To those who’ll arrive by car, we are sorry to inform that we don’t have any specific parking area near festival venue. Concerts in SOA festival last until 10pm. You can find information about accomodation from Tampere city website. We don’t have any own camping area, near Tampere centrum is camping area Härmälä. In Tampere centrum are also cheap hostels and hotels, for example Omena hotel and Uimahallin maja. 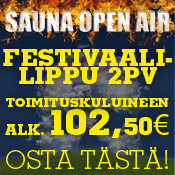 Sauna Open Air Metal festival has no agelimit. Children under 7 years are free of charge when coming with their parents. Agelimit to bar areas is 18. Agelimits to after partys will be confirmed later. Video- and professional cameras and recorders are not allowed.